Dnav.com is classified as a browser hijacker, because it can change your browser settings upon arrival. The hijacker comes from the Trovi family and uses freeware and shareware bundles in order to spread online. It enters your PC, alters your settings, and causes other modifications related to generating web traffic. By promoting its sponsors, the developers of the unwanted app make money. Although it may be advertised as a tool that will provide you with the best search results, that is simply not the case. We advise that you terminate Dnav.com as soon as you can. As we have already mentioned, the hijacker makes use of the bundling distribution method. This means that it often enters the system without the user’s notice. It is important to always pay attention to the freeware that you install. If you do, you should be able to decline all additional offers of programs that you do not need. We suggest that you do that the next time you deal with third party software. The main symptom of the hijacker is the browser settings modifications. 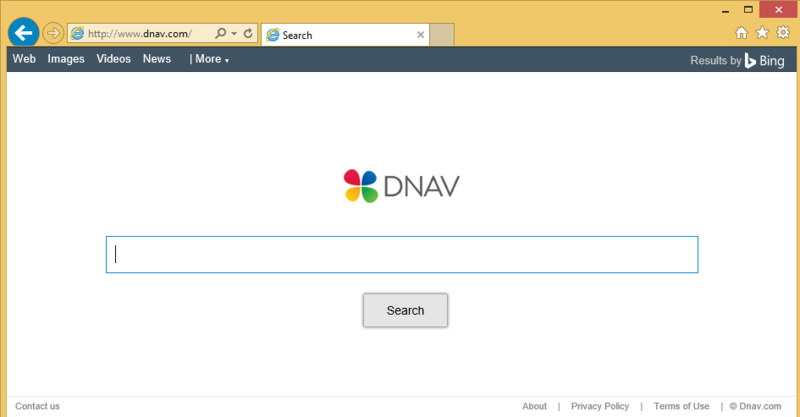 Your home page and default search engine get replaced with Dnav.com. The website may not differ much from other search-related domains, but it is used to present you with sponsored content. You will see sponsored links each time you search the Web with its help. In addition to that, you will also encounter ads no matter where you go online. Pop-ups, coupons, links, banners, and other types of adverts will continuously flood your browsers. They will not only disrupt your surfing, but also expose you to unsafe data. Interacting with the adverts is not something that we would recommend. You should not risk your computer’s security by allowing them to appear on your screen. In order to get rid of the ads, you will have to eliminate Dnav.com from your browsers. You can choose from two Dnav.com removal methods: manual and automatic. The automatic removal is the more reliable and beneficial one, because it allows you to fully clean your PC and keep it protected from other Internet-based parasites. If you use the anti-malware from our site, you will be able to get rid of Dnav.com without any difficulty. The utility will also provide you with real-time online protection, so that you do not have to worry about various infections while surfing the Web. The alternative solution is to delete Dnav.com manually. This can be done with the help of the instructions presented in the manual Dnav.com removal guide right below the article. They explain how you can uninstall the program that arrived with the hijacker and how you can fix the browser settings that have been altered by it. If you follow the instructions carefully, you should have no trouble with the removal process.